The Coach & Horses Inn01291 4203532work InnThe Coach and Horses Inn is a 17th century Inn located in Caerwent, Monmouthshire, South Wales. 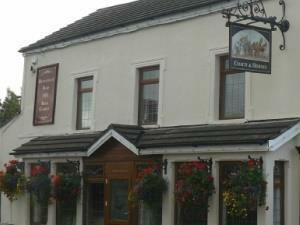 The Coach & Horses in Caerwent has three newly refurbished rooms available throughout the year for people who require a weekend break in the South Wales Valley’s to an extended break or even local events such as golf tournaments at any of the local golf courses or even horse racing at Chepstow racecourse. The Coach and Horses offers full access to the rooms via the pub which is also accustomed for disabled people. Each room has it’s own unique view across the South Wales landscape enhancing the quiet tranquil beauty needed to get away from fast paced life. Breakfast is served between 8am & 10am in the restaurant every morning. A choice of cereals, toast or even a full Welsh breakfast accompanied by fresh juice, tea & coffee is available.